In the Cloud: Security (products, solutions, technology) instantiated as an operational capability deployed within Cloud Computing environments (up/down the stack.) Think virtualized firewalls, IDP, AV, DLP, DoS/DDoS, IAM, etc. For the Cloud: Security services that are specifically targeted toward securing OTHER Cloud Computing services, delivered by Cloud Computing providers (see next entry) . Think cloud-based Anti-spam, DDoS, DLP, WAF, etc. What I’m talking about here is really item #3; security “by the cloud,” wherein these services utilize any cloud-based platform (SaaS, PaaS or IaaS) to delivery security capabilities on behalf of the provider or ultimate consumer of services. As many vendors “virtualize” their offers and start to realize that through basic networking, APIs, service chaining, traffic steering and security intelligence/analytics, these solutions become more scaleable, leveragable and interoperable, the services you’ll be able to consume will also increase…and they will become more application and information-centric in nature. Again, this doesn’t mean the disappearance of on-premises or host-based security capabilities, but you should expect the cloud (and it’s derivative offshoots like Big Data) to deliver some really awesome hybrid security capabilities that make your life easier. Rich Mogull (@rmogull) and I gave about 20 examples of this in our “Grilling Cloudicorns: Mythical CloudSec Tools You Can Use Today” at RSA last month. Get ready because while security folks often eye “The Cloud” suspiciously, it also offers up a set of emerging solutions that will undoubtedly allow for more efficient, effective and affordable security capabilities that will allow us to focus more on the things that matter. 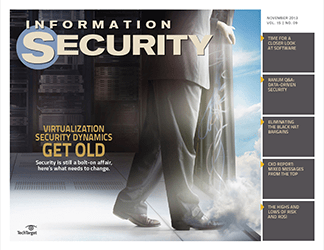 CA recently sponsored the second in a series of Ponemon Institute cloud computing security surveys. The latest titled “Security of Cloud Computing Providers Study (pdf),” released this week, examines “cloud computing providers'” perspectives on the same. You can find the intro here. While the study breaks down the survey in detail in Appendix 1, I would kill to see the respondent list so I could use the responses from some of these “cloud providers” to quickly make assessments of my short list of those to not engage with. I suppose it’s not hard to believe that security is not a primary concern, but given all the hype surrounding claims of “cloud is more secure than the enterprise,” it’s rather shocking to think that this sort of behavior is reflective of cloud providers. We surveyed 103 cloud service providers in the US and 24 in six European countries for a total of 127 separate providers. Respondents from cloud provider organizations say SaaS (55 percent) is the most frequently offered cloud service, followed by IaaS (34 percent) and PaaS (11 percent). Sixty-five percent of cloud providers in this study deploy their IT resources in the public cloud environment, 18 percent deploy in the private cloud and 18 percent are hybrid. The majority of cloud computing providers surveyed do not believe their organization views the security of their cloud services as a competitive advantage. Further, they do not consider cloud computing security as one of their most important responsibilities and do not believe their products or services substantially protect and secure the confidential or sensitive information of their customers. The majority of cloud providers believe it is their customer’s responsibility to secure the cloud and not their responsibility. They also say their systems and applications are not always evaluated for security threats prior to deployment to customers. Buyer beware – on average providers of cloud computing technologies allocate 10 percent or less of their operational resources to security and most do not have confidence that customers’ security requirements are being met. Cloud providers in our study say the primary reasons why customers purchase cloud resources are lower cost and faster deployment of applications. In contrast, improved security or compliance with regulations is viewed as an unlikely reason for choosing cloud services. The majority of cloud providers in our study admit they do not have dedicated security personnel to oversee the security of cloud applications, infrastructure or platforms. Providers of private cloud resources appear to attach more importance and have a higher level of confidence in their organization’s ability to meet security objectives than providers of public and hybrid cloud solutions. While security as a “true” service from the cloud is rarely offered to customers today, about one-third of the cloud providers in our study are considering such solutions as a new source of revenue sometime in the next two years. Reprise: On-Demand SaaS Vendors Able to Secure Assets Better than Customers?